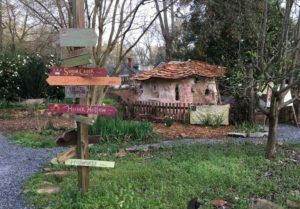 Oakhurst Garden is magical and whimsical and hearty. 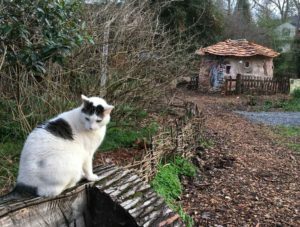 This garden is full of nooks and crannies and has it all including a cob house named Ox and a cat named Cardoon. Oakhurst is here to serve the greater Atlanta community as a beautiful space to learn and enjoy. It has community plots, a greenhouse, a mini-farm, herb garden, chickens and pocket ecosystems throughout the site. It is an excellent spot for big events hosted by the Wylde Center and outside organizations and individuals. Like all of our sites, it is an wonderful place to hold field trips and to learn while being outside. 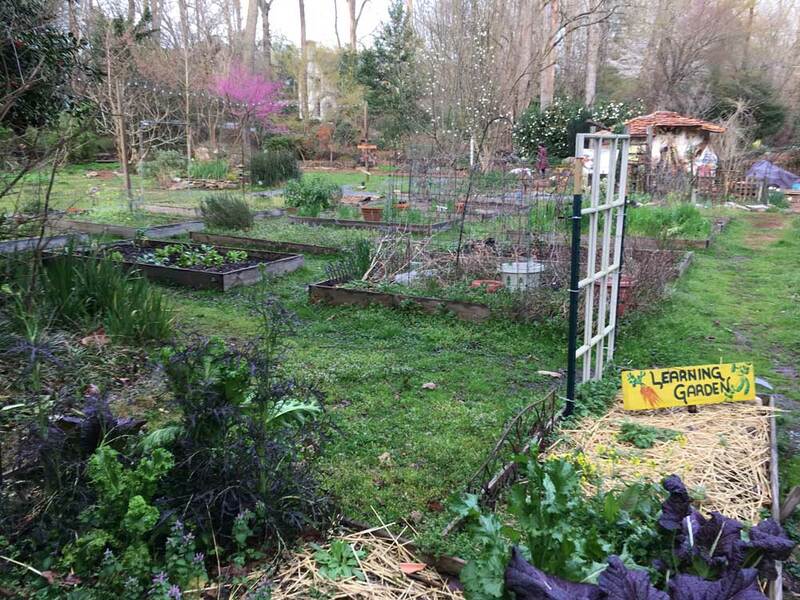 The Oakhurst Garden is located at 435 Oakview Road, at the corner of South McDonough Street and Oakview in Decatur, just southwest of Agnes Scott College. It is open to the public from sunup to sundown. View map. 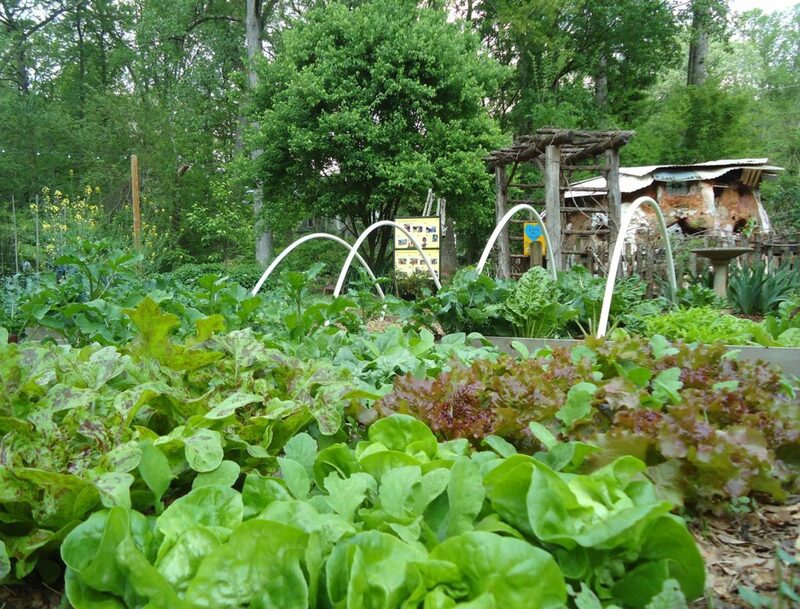 Oakhurst Garden has 24 plots available to the community for growing vegetables and flowers. Commitment to giving ten community service hours back to the Wylde Center. Calling all forest lovers! 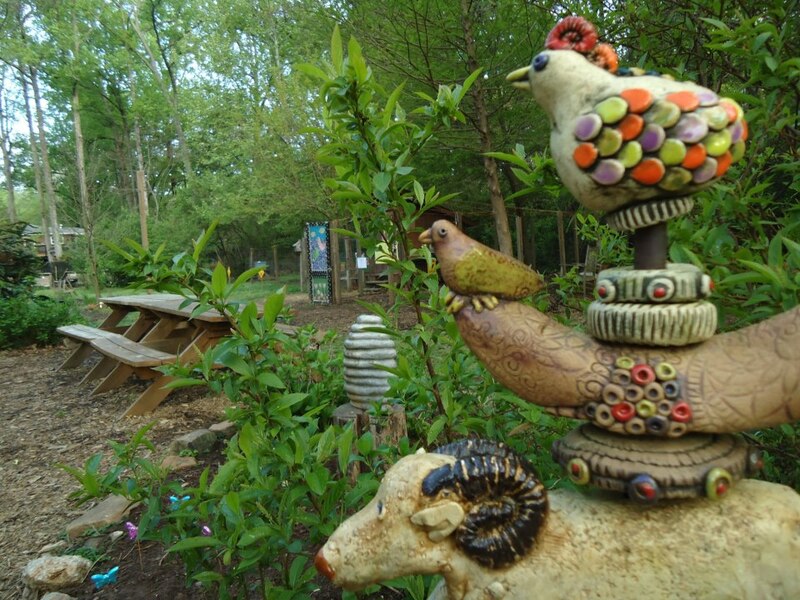 Join Kat and Frances at the Oakhurst Garden to help and learn about our Native Woods! Just show up, sign in on the porch and dig in! Group service opportunities available with a max of 15 volunteers. 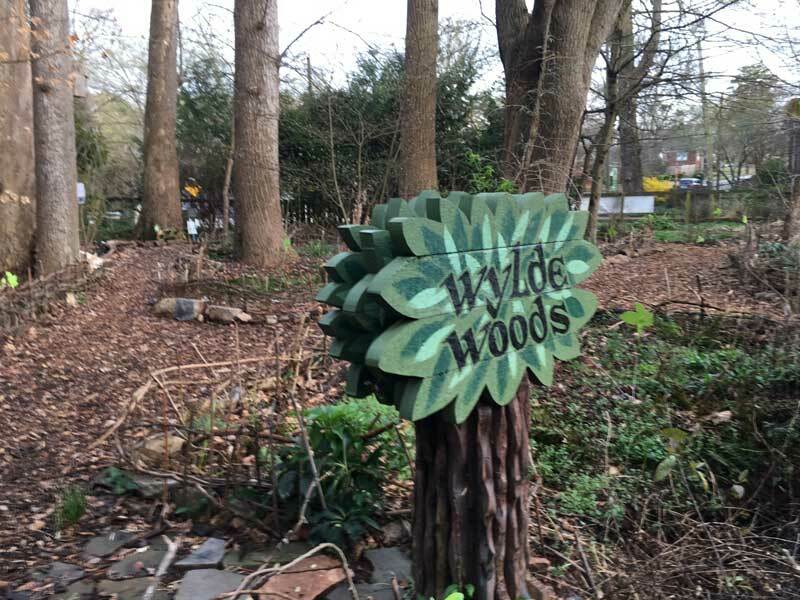 Contact volunteer@wyldecenter.org with WYLDE WOODS VOLUNTEER in the subject line to schedule a group. We have a beautiful cobb playhouse! It is a favorite attraction for our young garden explorers. The name of this wonderful structure is Ox and it was made from the earth by Aviva Kessler and our outstanding volunteers. Ox was rebuilt by community volunteers in 2019 after being crushed by a fallen tree. Come visit the newly refreshed OX today. Our hives pollinate the garden and serve as a teaching tool for visitors, classes and camps. Our classes and camps offer hands-on experience with feeding and caring for bees and with extracting delicious local honey from the hives. Visitors on Field trips get to taste the honey and learn about the benefits from bees from our staff. 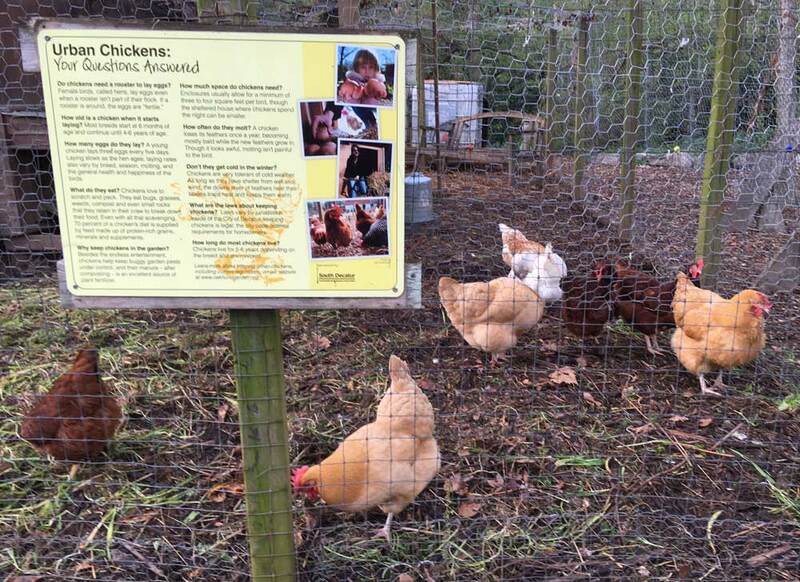 Our bees live with the chickens and thrive with the help of beekeeper Brandon Tai. 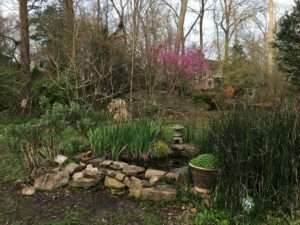 The pond was built in memory of Liz Chandler, an Agnes Scott College student who devoted many hours to creatures in the garden. Agnes Scott College, EcoWatch volunteers, and Emory students helped build the pond. Frogs have moved into the pond and are a constant source of enjoyment for the children who visit the garden. See if you can find the five goldfish calling the pond their home! 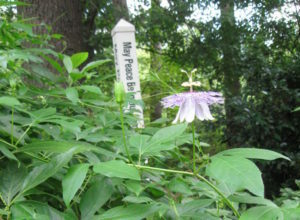 In 1997, the same year the garden was started, the garden was asked if it would like to plant a Peace Pole on its site. A Native American Shaman and Maori Medicine Man were present to dedicate the Peace Pole. As sage was burned, participants stood in a circle around the pole and were asked to share a thought. As Sally remembers it, the birds were especially loud that day joining in with the blessing of the Peace Pole. Oak Creek, a tributary to the West Shoal Creek runs through the garden property. The garden plans to restore the streambank using native trees, shrubs, and perennials to stabilize the bank. 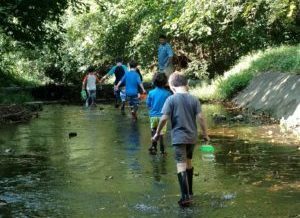 The Shoal Creek Watershed Alliance is a volunteer group that regularly monitors the water in the creek. In a recent survey of stream life, the group found small fish, salamanders, crayfish, flies, beetle larvae, and damselfly larvae. In 2010, with the mural on the side of our garden house looking a bit faded, we began a collaborative effort to make our dreams of a more colorful garden space materialize. Zach Monette, one of our dedicated volunteers, got the ball rolling by seeking out artists in the community and working with Ace Hardware and Sherwin Williams to acquire paint supplies, which they very generously donated to the project. 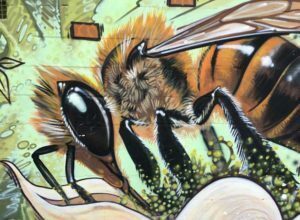 Learn more about mural artist Shaun Thurston. 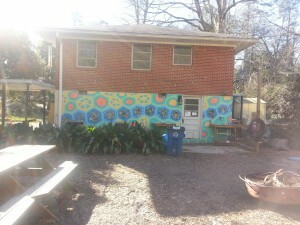 In 2015 Molly Rose Freeman, an Atlanta muralist was commissioned to do a recycling-themed mural on the back wall of the Wylde Center offices. Learn more about Molly Rose Freeman. Cardoon is our Wylde Center cat. In 2013 the Wylde Center rescued him from the Dekalb Animal Shelter to help alleviate a rodent problem. He has definitely been the best pest control investment we've ever made! Cardoon gets fed once a day by staff and volunteers. He is well fed, so please don't feed him any extra. You will often hear Cardoon's melancholy meow, but we assure you he is a very happy boy! He spends most of his days lounging in an office chair he "shares" with our plant sale manager, MJ or finding sunny spots in the garden. From artist Matthias Neumann: “Shelter II (basics)” is a site-specific installation that continues a body of work under the title “basics”, exploring an abstracted notion of form, material, space and utility. The work wants to be experienced both as an abstract sculptural gesture as well as an interactive spatial environment. “Basics” encourages an uncertainty in the dialog between the viewer and the work, opening possibilities in the public quality and appropriation of the work. The temporality of the site-specific intervention is mirrored by the material and constructive logic of the work.” Learn more about Matthias Neumann. 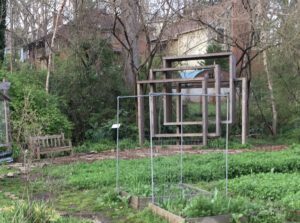 Dedicated on May 6, 2000, the designation of the Oakhurst Community Garden as a Garden for Peace marks the first site of its kind in the network. Other gardens in the network are located at the Atlanta History Center; Agnes Scott College in Decatur; Botanical Garden in Madrid, Spain; Lakewold in Tacoma, Washington; Pastoral Institute in Nairobi, Kenya; Columbia Theological Seminary; and on the grounds of the Sarah P. Duke Garden. The Gardens for Peace dedication included the presentation of a special banner made by the neighborhood Girl Scout Troop. Special activities included building scarecrows for the garden beds, listening to a storyteller and an opportunity for the children to write down their wishes for peace and place them on a special tree. Team Chicken is a long-running cooperative effort. Ten families care for the girls and divide up shifts and share the cost of feed and straw. Folks come twice a day to let the chickens out, feed them, close them up at night and collect eggs in exchange. Weekend coop-cleanings are also shared amongst the group. Our coop is volunteer-built and it's quite large at 8 ft x 5 ft x 6 ft. It's up off the ground and has a slanted roof. It has a human door and a chicken door and two small sliding windows with screens. The hen house has a fenced in lot that's about 350 square feet. 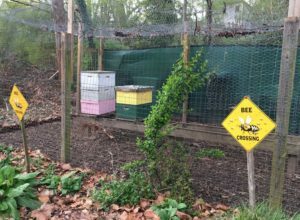 We added a new adjacent apiary (bee yard) in March 2011 with three beehives. The chickens love it. Birds and bees live together! Many people ask us about what kind of chickens we have. Our chickens change yearly as we get new layers, but you can find anything from Lavender Orpingtons to Black and White polish Crested!